Toyota has given the Prius+ an update for the 2015 model year, the Japanese pioneer of hybrids has announced. 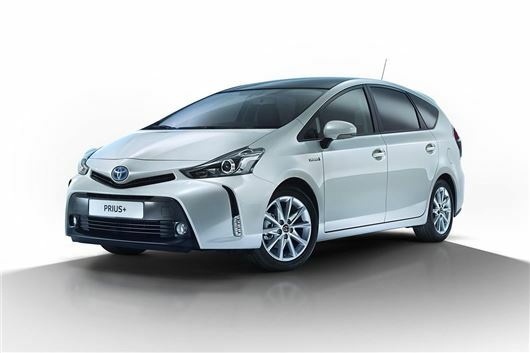 The bigger Prius, which was launched in 2012 and remains Europe’s only seven-seat petrol-electric hybrid, will hit 2015 with a new face, some new colours and more standard equipment. The most obvious change is to the front end, which unsurprisingly adopts Toyota’s latest, much sharper corporate face, so that it looks more like the new Aygo – an aesthetic achieved by altering the upper grille, the headlamps and the LED daytime running lights. A similar job is done at the rear, with the taillights now adopting something Toyota calls a “light guide,” thus achieving the distinctive ‘signature’ that all manufacturers strive for these days. Two new colours emphasise the car’s update, which based on their names will basically be maroon and black (‘Dark Cherry Metallic’ and ‘Attitude Black Mica’), though Toyota hasn’t seen fit to show them with the announcement. In the cabin there’s now chrome finish for the door handles, while darker silver metallic is used to trim the switchgear, for a classier look. The air vents are slimmer, and a new 4.2-inch TFT information screen is both brighter and more intuitive to operate than before. The screen incorporates a new “Eco Judge” function, which is designed to aid the driver in making the most parsimonious choices possible. And with the visual changes come some mechanical ones, including suspension tweaks for improved comfort, and additional sound damping material at the rear of the cabin. There is no announcement on prices just yet, nor full specification, but expect to hear of a slight cost increase towards the end of the year.